Marchers congregated early, filling the corner of Pacific Avenue and Cathcart Street by 8 a.m. There was a cold bite in the air as people posed for photos commemorating the event. 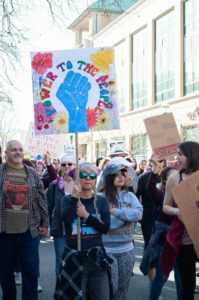 People of all ages wielded vibrant feminist signs at the Santa Cruz County Women’s March last Saturday. Cynthia Hawthorne, an organizer of the county’s third annual march, estimated the event drew 20,000 people this year, down 10,000 from last year. Despite diminished attendance, marchers filled Pacific Avenue several blocks at a time. Large, political and creative signs are a big part of women’s marches all over the country. The theme of this year’s march was “Truth to Power,” which for many resonated with the current political climate. “We’re demonstrating our democracy to try to turn over the Trump administration,” said Angela Marshall, a volunteer for the event and an organizer for Santa Cruz Indivisible, a group dedicated to a progressive political agenda. The pushback against the Trump administration was palpable, with participants viewing the event as an opportunity to publicly showcase their dissatisfaction with the administration’s actions. 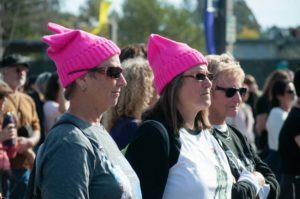 Marchers sporting pink pussyhats, which have become synonymous with this event, watch a speaker at the rally. In the past several months, the Southern Poverty Law Center and several other groups disavowed the national Women’s March for its controversial associations. Additionally, the Santa Cruz Women’s March faced criticism on the UCSC campus for its strong ties with the Santa Cruz Police Department. In light of national and local disapproval, keynote speaker and UCSC faculty member Bettina Aptheker highlighted coalition building and unity in her speech. Other groups, like National Nurses United (NNU), were driven to the march to advance specific causes. “We’re going to advocate as strongly as we can, to change our healthcare system to one that’s affordable and will be available to everybody without restrictions,” said Earl Labow, a retired psychologist who marched with the group. NNU joined other unions and cultural groups in the county clerk’s office parking lot. Some, like Court Appointed Special Advocates, were there to recruit members to join the organization or volunteer. Others, like Santa Cruz Indivisible, set up booths for marchers to write letters to their representatives.